I found a draft version of this post on my computer, and can’t believe that I forgot to finally update it. Sheesh. 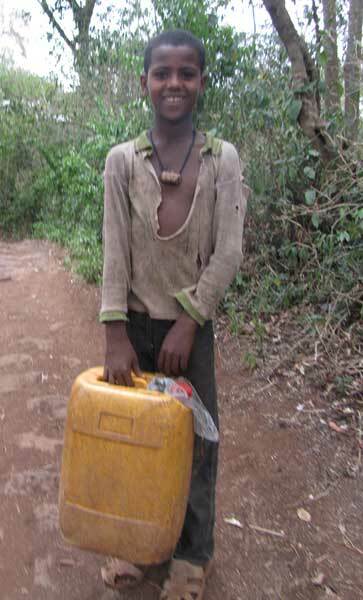 Anyway folks, here are some more of the photos from my recent stint in Ethiopia. Hope you enjoy. Coming up next: a detailed description of the Ethiopian coffee ceremony. First, here is a shot I took while out in the countryside – the guy on the roof here looks like he’s just casually listening in to an interesting conversation. In reality, he was a total daredevil. When the van was in motion, he sat on the roof, clinging to the big package that you see strapped on to the cargo carrier. I’m not sure if he was doing that to try to keep the package steady on the roof, or if by riding outside the passenger compartment, maybe he got a break on the fare. Or maybe he just like the feel of the wind of the open road in his hair. Whatever – by his clothes, he didn’t look in that desperate financial shape … certainly not as bad as the kids I saw clamping on to the spare tire carriers on the backs of SUVs for a free ride (often with tragic results). 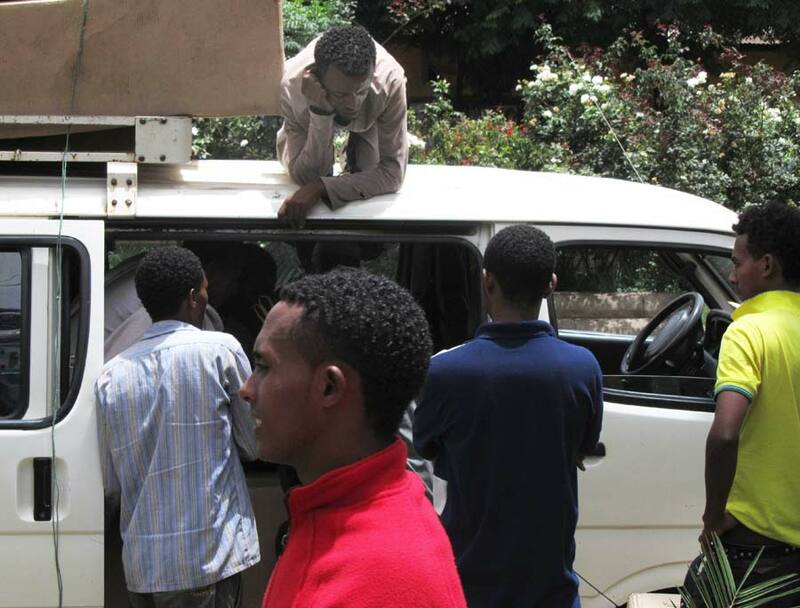 Sometimes the passengers choose to ride on the roofs of the ubiquitous blue minivans that are the backbone of the public transportation system in Ethiopia. 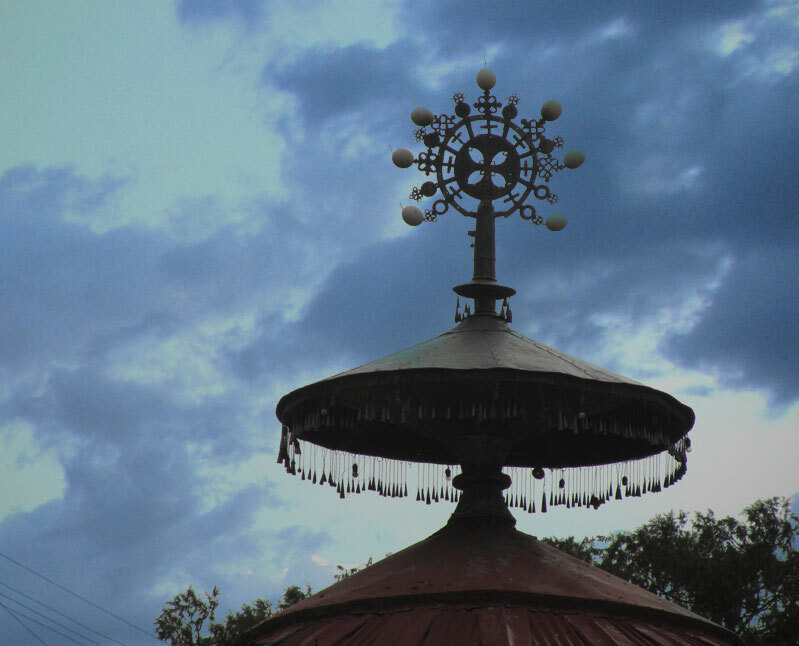 Anyway, the next shot is taken from the tour of the ancient monasteries in Lake Tana. I actually got to handle some of the illuminated manuscripts – a real honor, I guess. These are the types of things that I am accustomed to only seeing under glass, in heavily guarded cases, in museums. It was a strange feeling to handle something this old and this precious. Then again, the monks didn’t really seem all that put out by the experience. I guess when you’ve grown up in an area where human history goes back 3 million years, something that’s only a few thousand years old isn’t all that remarkable. It is amazing how vibrant the colors still are in this book. 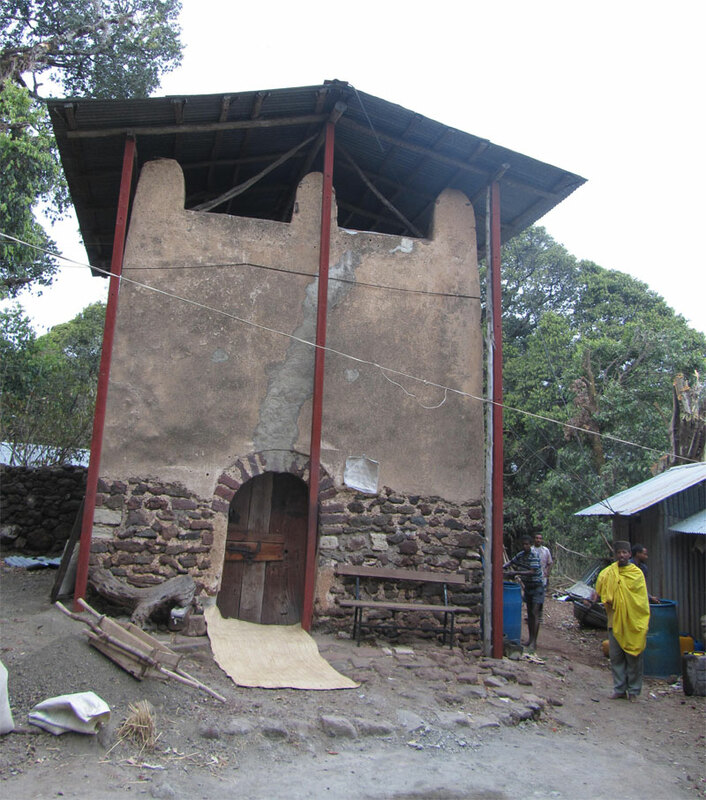 Here are some more of the photos I shot when I was visiting the ancient monasteries out on the isolated islands of Lake Tana. This first shot is the typical tourist shot, I know. The murals and tapestries here date back to about the 16th century, although there are earlier paintings and artwork. Yeah, I know I kinda look like Long John Silver here, being stared at by all the little angels painted on the walls. 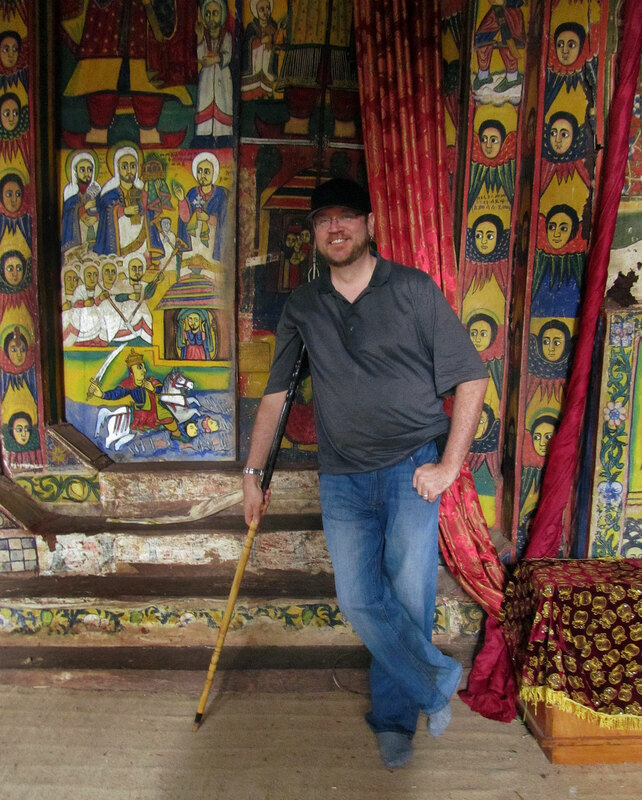 The Ethiopian Orthodox churches do not allow you to sit, so the congregation has to lean on these sort-of crutches. 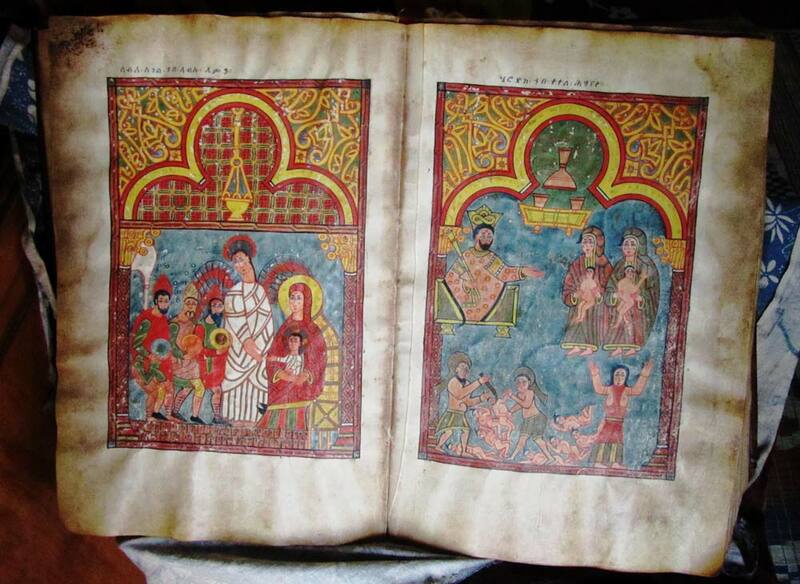 The artwork here shows the influence of all the cultures that have touched Ethiopia over the centuries.